Five new units for affordable rent and shared ownership have just reached practical completion in Bathampton. 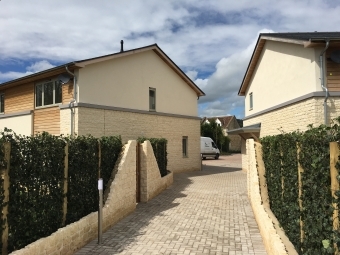 Built by Charlcombe Homes on behalf of Knightstone Housing Association these homes form part of a 15 house scheme currently under construction on the former Jewson Timberyard located in the Green Belt in Bathampton. The 10 market units currently under construction are being built to a high standard with a number now being sold off plan. The show home opened at the end of April 2018.